The Atlantic Maritime Prefecture has published an inventory of the ship's cargo that sank on March 12th. 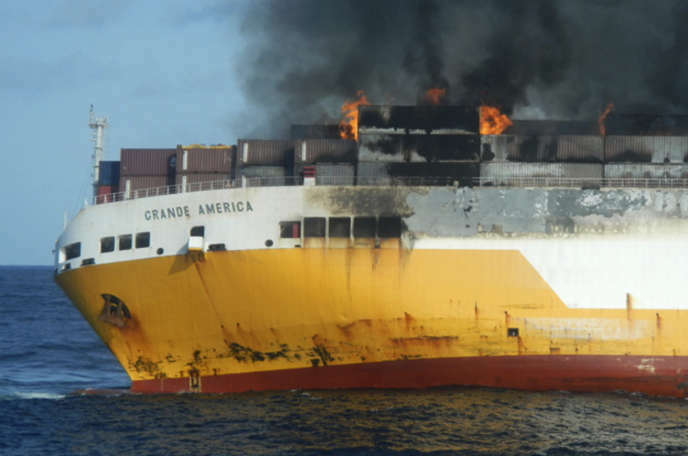 The Italian ship Grande-America , which sank on March 12, contained 1,050 tons of hazardous materials, according to the detailed inventory of the cargo released Thursday, March 21 by the Maritime Prefecture of the Atlantic. The detailed list of the load was communicated to five environmental associations during a meeting in Brest with the maritime prefect of the Atlantic, before being published on the Internet. The day after the sinking, the prefecture (Premar) had prepared a first inventory, speaking of 365 containers, 45 listed as containing hazardous materials. Read also Shipwreck of "Great America": "We never really know what's in containers"
Of the 2,100 vehicles transported, the load contained 190 trucks, 22 buses or 64 construction machines. On the fuel side, in addition to the 2,200 tonnes of heavy fuel oil already listed, the Great-America transported 190 tonnes of marine diesel and 70,000 liters of oil. "Everything is disturbing in this inventory"
"Concerning the cargo, additional information was requested from Grimaldi Group [the shipowner], " Prémar said in a statement. According to Jacky Bonnemains, of the Robin des Bois Association, present at the meeting, "this is the first time in the history of maritime accidentology that such a detailed inventory is made public" . "Everything is worrying in this inventory, both hazardous and non-hazardous goods, probably with computers, automotive spare parts, even a highly explosive hydrogen vehicle (in contact with the air) and we have 55 containers of which we ignore the content. " specialized in the accidental pollution of water, was reassuring, remembering in particular that the acid, "dipped in a liquid element and especially in as much water is diluted . " About the 2,100 vehicles, he recalls that "many things (...) are neutralized by the marine environment, as asbestos" . "We are in an area where there are very, very few currents and in full in a big anticyclonic bubble. So we do not have wind, so the pollution stays in place, but it is not easy to catch because it is fragmented . " Great-America sank on March 12, 333 km west of La Rochelle by 4,600 meters bottom after a violent fire. Its 27 occupants were rescued.